TRIGGERED: Texas Restaurant Comes Under Fire for Transgender Bathroom Doors — Condition Yellow: Stay Alert. Stay Alive. Pictured from left to right: a biological male, a biological male. They’re calling him a woman though, right? That’s generous! Why are people offended? They’re saying trans people can use the women’s restroom! Isn’t that what they wanted? There's no way to win with the unrelenting left. They insist that transgender men are actually female, but get angry when a restaurant uses humor in agreement with them. Displaying photos of a transgender persons appearance when they were suffering severe dysphoria. It's rude, mean and heartless. One has to wonder if Herbst realizes that he's also suffering from the same dysphoria that afflicts Jenner. Many loyal customers praised the restaurant’s joke, calling it ‘creative’ and ‘hilarious’ however others failed to see the funny side. They thought the signage was ‘offensive’, ‘disgusting’ and ‘insensitive’ to the trans community. Airing their criticism on social media, some vowed to boycott the restaurant until it changed the doors. Among them was Jess Herbst, the transgender mayor of New Hope, a town 12 miles away. ’This is offensive to trans folks,’ she tweeted after being made aware of the doors. 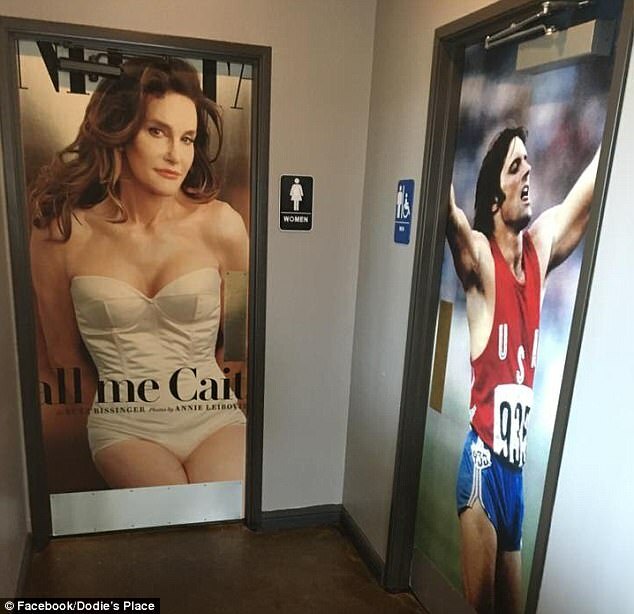 ’Dallas friends, do feel free to publicize the blatant trans bigotry at Dodie’s place in Allen,’ said another critic. Others labeled the doors ‘pathetic’ and vowed never to return to the restaurant. Owner Kyle McPherson at first appeared to relish the outrage and shared a news article about the doors on Facebook. ’Finally Bruce/ Caitlin got the attention of the media,’ he wrote, spelling the 68-tear-old’s name incorrectly. He has since removed the post from social media. The restaurant has made no public comment about the doors and there was no answer there on Thursday morning. The original August post which revealed them still remains on social media. There's just no pleasing the left. Sep 26 Politics Supersedes Science: University Bans Transgender Research Because It Could "Offend People"